Technology investors and venture capitalists are betting big time on India: $1.3 billion or Rs 7800 crore worth of investments have already been done in the last 12 months, with 82% of all investments going to startups and early stage investments. In the last four quarters, Indian tech ventures have collectively raised $1.3 billion spread across 266 deals, which is 69% more compared to last year. In the first quarter of 2014 alone, $427 million worth of investments were made in as many as 64 deals. Q1 2014 was also the quarter which saw maximum funding amount over past 8 quarter. These numbers were released by a VC Database company, CBInsights. 1 Where Did The Money Go? If we count the number of investments, then education and eCommerce industries received the same number of deals; whereas travel and apparel industry closely following by. However, if we analyze the amount of deals, then eCommerce is the easy winner: 72% of all investments went into eCommerce portals who wish to become the next Amazon of India. Such investments in eCommerce include $360 million Series E venture funds for Flipkart as well as three separate investments for Snapdeal totaling $255 million. Among the education niche, the top investments include $10 million for SimpliLearn Solutions & $2 million for eDreams Edusoft. In terms of total investments and the number of deals, Bangalore takes the top position followed by Delhi. 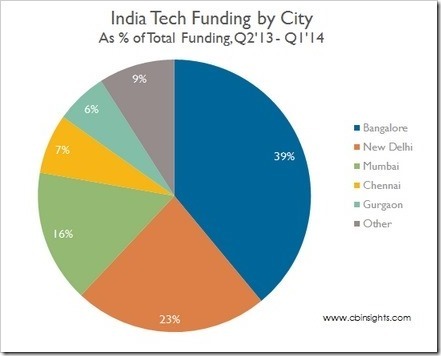 39% of all tech investments in India during last 12 months happened to Bangalore based companies. 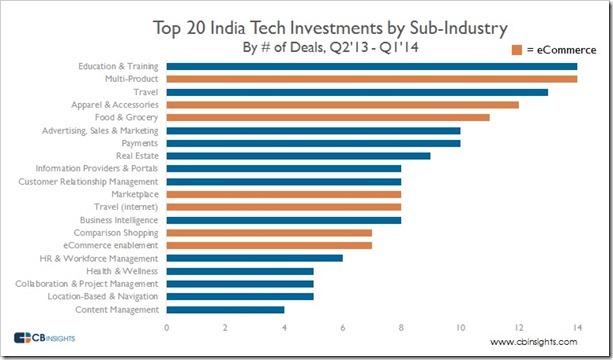 Delhi is at second with 30 deals and $300 million worth of investments. If we add-up Gurgaon, Noida and Delhi into one, then the total tech investments add up to 29% of overall technology related investments in the country. 500 Startups has emerged as the most active investor among all, as they invested in more than 20 deals in the last 12 months. 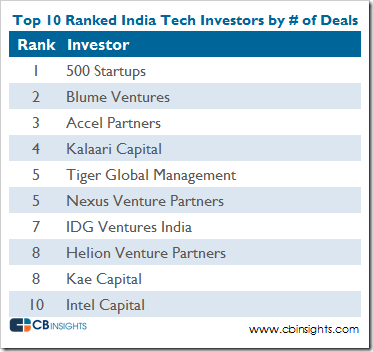 Blume Ventures is at #2 position and Accel Partners, who have invested in Flipkart and Myntra is at #3 rank. Interestingly, out of the top 10 investors, only 4 are Indian VCs: Blume Ventures, Kalaari Capital, IDG Ventures India, Kae Capital. Others have active presence, but their headquarters are based outside India. Based on the data on investments in India, it is clear that eCommerce and multi product portals are right now attracting maximum attention. However, Education tech based companies are also on investors radars attracting good amount of funds as well. Travel and Apparels industries are also looking promising. However, there are certain new verticals such as Content Management, Location based Services and Health Care niche which are showing a lot of promise from investors perspective as well.